If you have Jupiter in Aquarius, you are a humanitarian and are concerned with the welfare of all people. You believe in the universality of life and the brotherhood of man. Reform and large group projects appeal to you as they give you wide scope for your own personal growth and expansion. You work well with others because of your inventive mind, your keen judgment, your fine intellect and your friendliness. You are intuitive, tolerant and sociable. You make an ideal diplomat, labor relation specialist or personnel manager because of your knack for handling various groups of people. 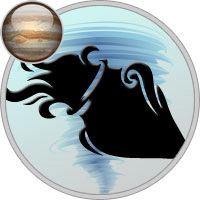 With Jupiter in Aquarius, you’re interested in new ideas, large projects and reform, and are drawn to humanitarian groups and efforts. Idealistic, progressive, and an experimenter with new philosophies and religions, you also plant your own ideas in the minds of others. You work well with others, your sense of fairness is universal and impersonal, and you play no favorites when it comes to being just. You’d make a good scientist, diplomat, organizer, personnel manager, or someone in labor relations.